Lisa graduated from West Chester University with a BS degree in Music Education with a concentration in Flute performance. Lisa has studied on the graduate level at Montclair State University to obtain her MA in Music Education and Flute Performance. Drew University is the home of New Jersey's Flute Choir Day, where Lisa has been a coach of Level 2 flutists since the program began over 20 years ago. She enjoys sending her private studio students to participate in this wonderful day of fluting! All students from beginner to adult have the opportunity to play with other flutists from the tristate area and attend a master class with a world renowned flutist. 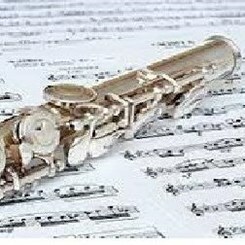 Lisa has taught private flute lessons for over 30 years in Princeton, Manalapan and Central and Northern NJ. As a freelance flutist, Lisa enjoys performing in NJ and the tristate area. For over 20 years, Lisa has taught music in the public school system and currently teaches music in the Bloomfield Public School District. She lives with her husband of over 25 years and their 3 daughters. Lisa is dedicated to not only educating but nurturing the love of music to all her students. Request Lessons with Lisa today!